...quod nos habuimus in loco Amen (a) dicto et quicquid ad illam curtem pertinet in pago Nominato comitis Oberenlongenahe in comitatu Gisonis via kartam nostram per tali "commutatione traderemus () nos () susciperemus. This charter is dated 10 May 1008, is signed by Heinrich II, and has been authenticated and/or publicised by Chancellor Eberhard and the authorised representative of Archbishop Willigis of Mainz. The Regesta (Imperii) refers to the document as one that covers the exchange of an estate in Nieder-Ohmen for one in Buchenbach. Diefenbach suggests in his book covering the matter of the Marburg district that the name AMENA derives from the river name, Amenaha, otherwise known as the OHM, and from that to Ohmen. He concludes (from that) that Count Giso either administered or possessed estates in the area of Nieder-Ohmen between Grünberg and Gemünden. On the grounds of the great distance between Wetter and Hollenberg he does not subscribe to the view that this Giso is the progenitor of the Gisonen dynasty (Diefenbach 3fff 196). The writer of the original German form of this feature, Kai-Hubert Weiss (KHW), considers this interpretation not to be convincing. The Gisones are documented as being imperial trustees up to the Westerwald, so to exclude them from the Ohm(en) district defies logic. Diefenbach provides no evidence to explain why he thinks Amena is so necessary to Nieder-Ohm. There is an Ober-Ohm (Upper Ohm) but this does not lie within the Oberlahngau. 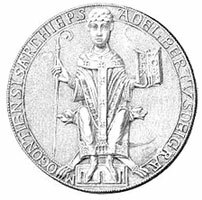 Could it be that the matter of the ownership rights regarding St Stephen's monastery in Mainz and the estates in Amena only arose after 1118? He sunt uille et uici decimationibus pertinentes ad prebendam fratrum in curtu Ebelezdorf: ( ) Amenowa et Amenowa, Wolmar media pars, Asepho, ( ), Ernesdehusun, Munechhusun, Warzbach, Brungozeshusun, Cagerenbach, ( ). Translating this passage caused some problems, not least because of the misspelling of cartam as curtem. An educated guess had to be taken in assuming that the word actually was cartam, meaning 'charter' or, more formally, a 'Royal Patent' (a Calendar of Patent Rolls and all that, amongst other things, deals with grants of lands or the removal of such). Sadly missing is just who the exchange was between, and what was exchanged for what. There is no mention of Buchenbach or St Stephen in the Latin text. Whatever the exact meaning of this, it would seem inappropriate to designate this Giso as either the progenitor of the Gisones of Hesse or to associate him in any way with Burg Hollende at the beginning of the eleventh century. A further indication of proven imperial estates is the fact that, since the time of the Carolingians, the Burgwald and Wollenberg were documented as being royal and imperial forests and at this time they remained so (Boucsein 47 ff; Henseling, Me, 13). A third argument arises from the aforementioned monastery that was founded in Wetter and the necessity to provide military protection for it, which required the presence of a count and which leads to [the suggestion of] the Gisones as counts and bailiffs. 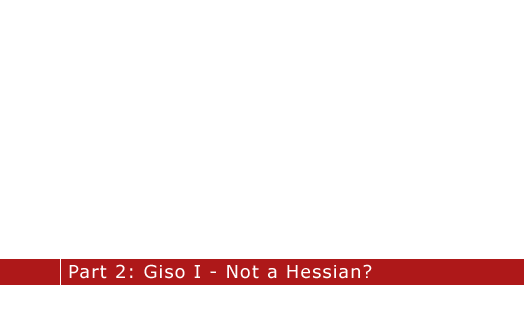 Giso I - a Hessian after all? That's all Kai-Hubert Weiss has to say about Giso I, but more can be gained from Johann Ernst Christian Schmidt's work, Geschichte des Grossherzogtums Hessen (History of the Grand Duchy of Hesse), Volume I, pp300-308. It all starts with a certain Graf Thankmar (Temmo) - not the eldest son of Heinrich, who suffered an unfortunate mishap similar to King Harold's at Hastings - first mentioned in 994 whose grafschaft (earldom) was in Viermünden (Fiormenni) and perhaps stretched to Ebsdorf. Following up on this Thankmar, there is an extract concerning him in the Regista Imperii dated 27 September 994, Sohlingen. The Latin text is as follows, written by Hildigardus, deputy chancellor to Archbishop Wiligus of Mainz, at the behest of Otto III. The word 'mansum' in the Latin text comes from 'mansus' which translates as 'Die Hufe'. A 'hufe' was a piece of arable land (in German this is 'ackerland', meaning that which can be ploughed), which was normally around thirty hectares, although it could be larger. At the request of our sister Sophia we grant to the cleric named Burchard part of our property a hufe which formerly was held by (Count) Hermann as a fief located in Viermünden in the county of Thankmar and situated in Hessengau as well as two slaves (serfs?) with their families. So what has Giso I to do with Thankmar? Here is what Johann Ernst Christian Schmidt (JECS) has to say. The exact meaning of in curtu is unclear, but the Ebsdorfer website - Ebsdorf is a short distance from Marburg - states that the emperors Heinrich II-IV had a house and lands there, some of which were donated to St Stephen in Mainz with Ebsdorf remaining under the jurisdiction of Mainz until the thirteenth century. 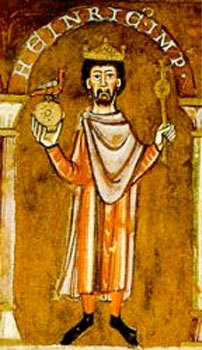 "The area in which the Gisones were to hold sway was, by 980, under the thumb of a graf named Tiemo. By 994 Thankmar had taken over, his particular patch being Viermünden and perhaps part of Ebsdof, followed by Graf Giso in 1008. According to sources his patch was Amena, either Upper or Lower (River) Ohm. It should be pointed out that at the same time from 1018 there was another (Gau)graf in the vicinity, in the district of Ebsdorf by the name of Richmund (already mentioned above)." It should be also pointed out that these are all fiefs; feudal possessions which could be granted or removed as happened to Graf Hermann in the case of the cleric Burchard, later bishop of Worms, by the German king/emperor. Somewhat later part of the territory mentioned above, as well as the Lower Lahngau, was granted to Graf Werner (also mentioned above), already a favourite of Heinrich IV. This territory also included Homberg an der Ohm, Gross-Linden (not Hohenlinden), and Weilburg. Perhaps Werner could thank his relationship with the emperor for the aggrandisement of his territory or perhaps Richmund died without issue. The year 1073 saw the death of another Giso. Possibly this is the same Giso named in a record of 1040. One reads that he was overtaken and killed by his enemies in his castle of Hollende. Hollende - or more properly Hohen-Linden - was situated between Biedenkopf and Wetter. The later counts, to whom jurisdiction of this area had been granted, named themselves after this castle and the Giso (I) now under discussion must now be considered their ancestor. Given the fact that this same area was at the same time where Thankmar had his domain, one has the right to consider this Giso to be either a successor or probable (possible?) descendant.